I’m back after an extended vacation from the blog. I’ve been a bit busy, so I’ll start with some good assessments of the year in ETFs and what we can learn from this historic period in investing. Index Universe puts up two good stories evaluating the past year. Murray Coleman takes a deep look at how ETFs performed last year and decides that they defied stereotypes. Meanwhile, Larry Swedroe, the director of research of the Buckingham family of financial services and author of “Wise Investing Made Simple” looks at the lessons of 2008. Originally, I had typed that lesions of 2008. I wonder if maybe that wasn’t a typo after all. RevenueShares Investor Services launched its fifth ETF under the family name RevenuesShares. The RevenueShares ADR Fund ETF (RTR) tracks the RevenueShares ADR Index which holds the same securities as the S&P ADR Index, but re-weights the constituent securities according to the revenue earned by the companies. ADRs, or American depositary receipts, trade in the U.S. but represent shares of stocks that list in foreign markets. The ETF provider, which launched its first three ETFs in February, uses an innovative index strategy, that, not surprisingly, weight indexes by revenue instead of market capitalization. This follows last week’s launch of the RevenueShares Financials Sector Fund (RWW). That ETF tracks the the S&P 500 Financials Index, but rebalances it according to revenues. RevenueShares follows a trend in the ETF industry in which new fund providers must created innovative indexes with the goal of beating market benchmarks in order to garner investor interest and assets. The RevenueShares aren’t the first ETF sponsor to use revenues, or any fundamental metric, as a basis for index weightings. Research Affiliates created the first fundamentally-based index, the Research Affiliates Fundamental Index, or RAFI, in 2005. It’s based on four fundamental factors, of which one is revenue. PowerShares launched the first RAFI-based ETF, the FTSE RAFI US 1000 Portfolio (PRF), which tracks 1000 large-cap stocks, the same year. There are now 22 FTSE RAFI ETFs. WisdomTree also uses fundamentals as the basis for its indexes, but these are weighted according to dividends. Spa’s MarketGrader ETFs chooses index constituents based on fundamental metrics, but uses an equal weighting instead. Since their February 22 inceptions, the net asset values of the RevenueShares Large Cap Fund (RWL) has fallen 10.6%, the RevenueShares Mid Cap Fund (RWK) has dropped 10.2%, and the RevenueShares Small Cap Fund (RWJ) is down 4%. Including today’s listings, NYSE Arca has 641 primary ETF listings, 84 ETNs and 25 certificates. Total exchange traded products listed on NYSE Arca represent 61% of ETF and ETN assets under management in the U.S., or nearly $304 billion. The Buffalo News in Buffalo, N.Y. gave “ETFs for the Long Run” and myself a nice writeup in advance of tomorrow’s talk at the University of Buffalo. (In the photo, I’m in the blue shirt.) The News asks “Are exchange traded funds the future of investing?” on top of the fold of the paper’s business section. 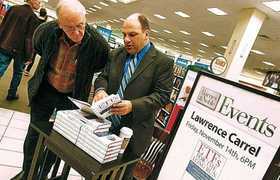 I will be signing copies of my book, ETFs for the Long Run, today, Friday, Nov. 14, from 6 p.m. to 8 p.m., at the Barnes & Noble bookstore at 4401 Transit Road in Clarence, 716-634-1011. Then on Monday, Nov. 17, I will be giving a lecture at the University of Buffalo Amherst campus about why ETFs are the best investment vehicle available for individual investors. The lecture will be held at the School of Management complex in Room 122 of Jacobs Hall at 5:30 p.m. There will be a reception afterward where he will be signing books. Both events are open to the public and are free. ETF firms have had a rough time over the past year. Launching new products during a major market meltdown is problematic. Investors watching their investments plunge in value are hardly looking for new products to invest in. Innovative products all around have been smeared with the scandal and dirt coming off of derivatives such as credit default swaps. And if investors are looking at ETFs, they are moving toward more conservative investments. They aren’t necessarily willing to take a risk on some new index of an obscure sector or other out-of-the-box ideas. So, it’s into this atmosphere that Rydex Investments launched the latest in its CurrencyShares family of exchange-traded products, or ETPs. On Thursday, Rydex’s CurrencyShares SM Russian Ruble Trust (XRU) began trading on the NYSE Arca. This new ETP is the first to offer time currency exposure to the Russian economy by tracking the daily price movement of Russia’s currency, the ruble, in U.S. dollars. It couldn’t have come at a worse time. The ruble has been in a sharp decline as the Russian stock market and economy enter a freefall coinciding with the plunge in oil prices. The day before the ETP launched, Russia’s central bank spent $2 billion to defend the currency. According to the Wall Street Journal, on Tuesday, the Russian central bank “widened its target band for the currency’s rate against a dollar/euro basket by about 1% in each direction. Investors quickly pushed the ruble to the lower limit.” This move reversed “weeks of rigid defense that fueled a $112 billion decline in reserves since the summer.” Then on Thursday, Russia’s two chief stock exchanges were shut down after stock prices plummeted. WSJ quoted Renaissance Capital economist Alexei Moiseyev saying, “Today’s move achieves nothing.” The modest decline in the ruble “has only served to raise market expectations of a further devaluation.” While industry leaders want to let the ruble weaken further to lower the cost of Russian exports, while increasing the prices of imports, government officials rule out a sharp devaluation. Such a move could send the nation into a panic. The eight CurrencyShares ETPs track the euro, Australian dollar, British pound, Canadian dollar, Japanese yen, Mexican peso, Swedish krona and Swiss franc. They are pure plays against one currency, and they trade like a regular ETF, with shares on a stock exchange. This is a big improvement over investing in the forex market. That popularity can be seen in the approximately $2.2 billion in assets under management they have acquired. This is 45% of the industry’s total currency ETP assets, according to Citigroup Global Markets’ Oct. 31 ETF Flow Report. Over the past three years, the CurrencyShares have been a very popular way for investors to profit on the falling U.S. dollar. But with the dollar’s recent rise, suddenly, it’s not such an easy trade. Of course, Rydex couldn’t have predicted oil prices would plunge when it filed to register this ETP with the SEC more than six months ago. Still, the mantra among ETF companies is that there is a demand for these products because investors are requesting these funds. It might be time to stop listening to these investors.